Originally this was going to be a simple "dodge asteroids" level, and while that is still mostly true, I felt like that wasn't enough, and didn't make much sense story wise. So I've included some mining elements to the level to add enemy variety and a story reason as to why the player needs to fly through this massive asteroid. On another note, I've become extremely interested in mobile game development and I'm planning on making a mobile version of this game (probably with a new story/levels) called Galaxy Star, using 8-bit sprites, chip-tune music, and the like. Stop what your doing, and play this game. Although it's missing its background, which I hope to work on tonight, everything you see in is working in-game. Oh, and apparently when I upgrade to my next phone (<3 Droid Bionic <3), Verizon will be nice enough to grandfather my unlimited Blackberry plan over. So I might actually be able to stay active on the forums again! Hurray! Thank you Dineyin, I'll give it a try, but I'm trying to use as few actors as possible to keep a solid FPS. Sorry to be so inactive guys, I hit my bandwidth cap last month and got to enjoy the experience of only having internet access on my BlackBerry (read: Destructoid, and about 3 Youtube Channels, that's it. ), but I have remained very active on Super Galaxy Star. Most of the pieces are in place and I can start building levels now, on my next update I'll try to have a playable level built. Boss included. Not finished yet, but good enough for testing. 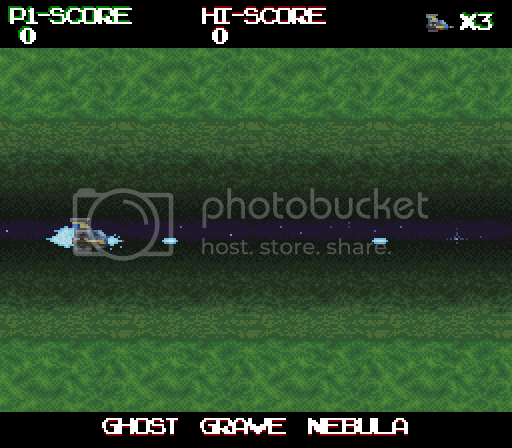 I've also put together a camera scrolling behavior called Shmup Camera, it allows you to have scrolling levels without the highly noticeable jitter effect. It's also programmable, so you can give it commands at certain points in a level (Such as, stopping and ending the level. You can also easily add new commands.). It's on the Forge now as Shmup Camera Pack v1. I hate to bring this topic back from the dead, but after running a few tests for my game, Greg's solution doesn't appear to work. At least not 100% of the time. Z and X to increase and decrease the scrolling speed. I tried two variations, first simply drawing the player's image inside the player's movement behavior, then having the actor that the camera follows spawn and draw the player's image. In both cases the player actor would jitter or start to jitter, regardless of movement speed or how the image is drawn. Though I did notice that sometimes when the image is jittering and the speed is increased or reduced it will stop jittering, or get worse. I can also confirm this. 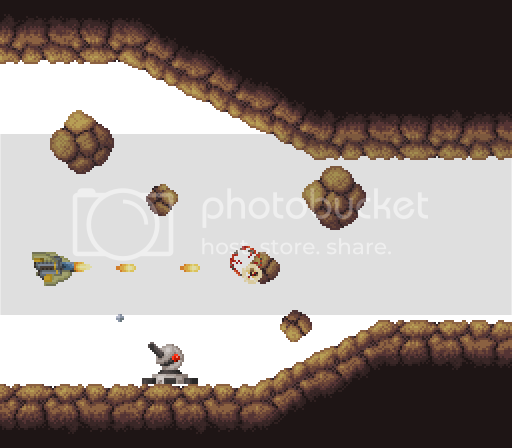 Explosions in Super Galaxy Star have had a tendency to "blink" when the player kills another enemy. I hope to have a boss completed by tomorrow night, or maybe a new level/player sprite. I'm skipping on any development tonight (or, at least for the rest of the day) because I'm getting a new bigger desk. Hooray! No more cramped workspace! Ask a Question / Re: Art Programs you use? MSpaint. and sometimes Fireworks. ._ . 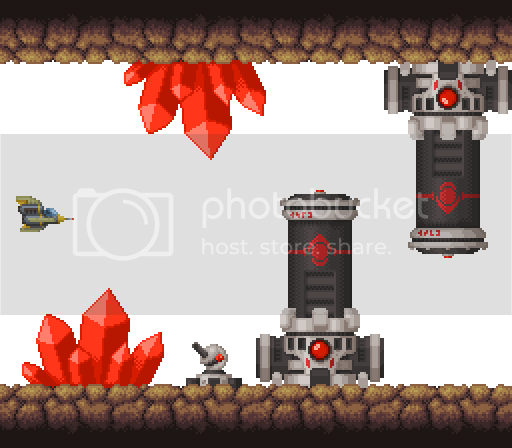 Completed the backgrounds for 2 more levels! They have a much bigger impact when you see them in-game, but I haven't programed or sprite anything else yet and this is why I didn't do an animation test. Just 5 more BGs left! or maybe there's a sixth! ooooh-oooooooh, it's a mystery! I see what you mean DaPatMan, I'll toy with the animation some more. Although my intent was to show the ship "adjusting" or shifting gears to slow down. 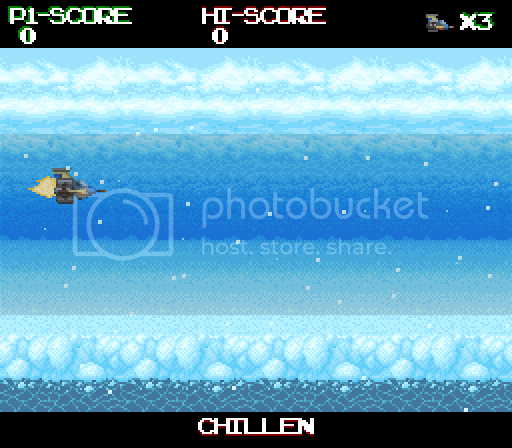 This test is showing of the second playable character's sprite, as well as the near finalized HUD and Level 3. I'm starting to think that the player's laser needs to be darkened or something, it sort of disappears in front of the lava. Okay so apparently my desktop did something to offend my laptop, and now the two won't talk with each other over my private network anymore, and I have to use a thumb drive to ship file between the two. Whatever, thing is I do all my pixel art on my desktop; because awesome monitor and more comfortable, but the laptop has internet access. So instead of doing small updates like I said in my last post :V, I'll try doing these larger interactive updates that display the graphics of the level I'm working on. Not sure how to do enemies and bosses yet, but I'll think about that latter. How does it look? Please post any animation errors or suggestions bellow! Ask a Question / Re: A few important behaviours I need help with. Global Attributes (Referred to as Game Attributes in Stencyl) can be created by clicking on "Attributes" in the Game Center near the bottom. Don't worry it's pretty straightforward. Quit lying, everyone knows you're BonBonBunny's alt. Jon why can't we add games to a favorites list, yet?